Its previously been seen that, as far as the process of social reproduction goes, a part of the constant capital is reproduced in kind, directly, whilst a second part is reproduced in kind indirectly from the output of other producers of means of production. This is an exchange of capital with capital, as opposed to an exchange of capital with revenue, or revenue with revenue. Where there is an exchange of capital with revenue (I (v + s) = II c) that is the means of production used in the production of consumption goods, the consumed means of production in II are replaced by new products, which are the result only of the new value created by labour in that year. In other words, as Marx sets out in Capital II, it is as though these replacement means of production contain no constant capital, at all, and in terms of their value, that is the case. This surplus product of Department I, as described in Capital II, and set out above, consists only of (v +s), and so no c, or in other words, it consists only of revenues, wages and profit (including rent, interest and taxes). Assuming no change in productivity, so that the technical composition of capital remains the same, as accumulation occurs, the portion allocated to wages must continue, or else the required labour-power cannot be provided. As far as the profit is concerned, as set out earlier, if it is absolutely large enough, a portion can be consumed unproductively, and a portion accumulated. But, this sets up a tension, because, on the one hand, the capitalist seeks to enjoy the profit personally, whilst competition drives him towards accumulation. As Marx said earlier, and as he analysed in Capital II, therefore, when we analyse the specific nature of capitalist production and distribution, as opposed to purely commodity production and exchange, the numerous potential causes of crisis arising from the separation of production and consumption, inherent within the latter become inevitable causes of crisis on the basis of capitalist competition and distribution. 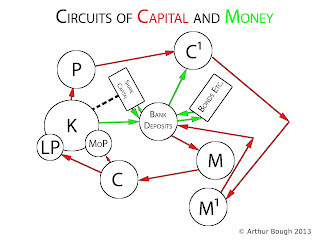 As Marx set out in Capital II, at each point of the circuit of capital, where capital value in one form must be metamorphosed to capital value in some other form, the potential for a rupture in that circuit is created, and on the basis of capitalist production on a mass scale, as a consequence of the introduction of machine industry, and industrial capitalism that potential is transformed into an inevitability. As soon as foreign trade is considered, it becomes apparent that the surplus product does not all go to variable-capital, because additional machines and materials are imported. It may be argued that the surplus is accumulated as variable-capital overseas, but the foregoing has shown that this is not the case. In fact, far from the surplus product being accumulated only as variable-capital, the more developed the economy, the smaller the proportion of the accumulation that will take the form of variable-capital. That is because the technical composition of capital increases as social productivity rises. As new technologies are introduced, so the quantity of material processed by a given amount of labour and machines rises, and so accumulation necessarily takes the form of an increase in the circulating constant capital, rather than the variable-capital. In terms of the advanced capital, fixed capital becomes a growing component, as the fixed capital stock accumulates. But, as Marx describes in Capital III, Chapter 6, it becomes an increasingly smaller part of the laid out capital, i.e. of the cost of production (d + c + v). That is for two reasons. Firstly, the motivation for introducing the additional fixed capital is to raise productivity. As a consequence, the level of output rises massively, and with it, the proportion of wear and tear of fixed capital, contained in each unit of output gets smaller and smaller. Secondly, as more fixed capital is employed, the volume of output rises for any given period of time, so the working period is correspondingly shortened. In turn, that means that the turnover period is reduced. The full value of fixed capital is included in the advanced capital, but only the circulating capital for the turnover period is advanced. As the rate of turnover rises, the laid out-circulating capital rises, relative to the advanced circulating capital. Where the accumulation of fixed capital takes the form of some new type of technology, this feature is enhanced, because it is not just a matter of the output per hour rising, as a result of additional machines, but of it rising because each new machine itself is more productive. 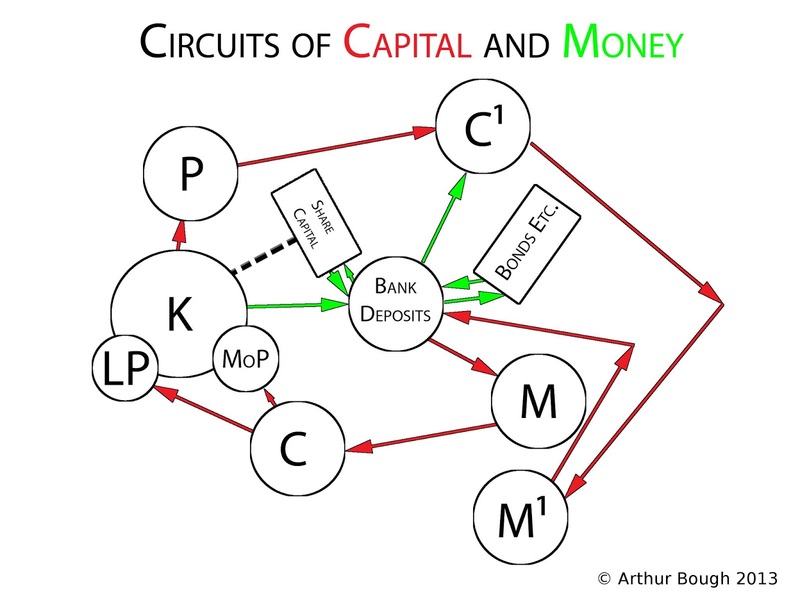 And the fixed capital is not only used in production; it is used to also speed up the circulation phase of the circuit of capital, as the fixed capital takes the form of new roads, canals, railways, storage facilities, telephone systems, the Internet, and all of the more efficient payments systems etc. that go along with it. This not only facilitates the accumulation of capital as means of production, but also as means of subsistence. BBC Calls On Corbyn to Denounce Jews! Why I’m standing against Nigel Farage in the European elections - As a working class immigrant, I'm sick of hearing people like Farage talk about representing the 'common man'.